When you first start blogging, it can be easy to get caught up in the newness of it. That’s when mistakes are likely to happen. 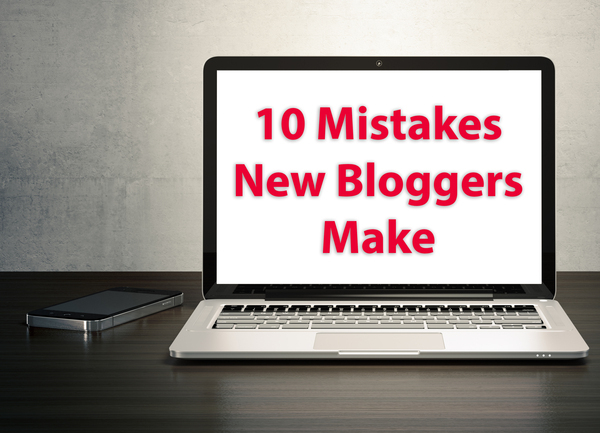 Here are 10 things to avoid as a new blogger. 1) Your posts are too hard to understand. Even the most sophisticated topics can be broken down and simplified. Your goal as a blogger is to work toward effortless reading. Each sentence should flow consecutively with no confusion or interruption. Blogging is not a chance to show off your high vocabulary skills — save that for Scrabble! If it’s inevitable you use unfamiliar-sounding terms, try using pictures. We’re visual creatures. Sometimes we have to see photos, charts, graphs, etc. to understand concepts. If you’re not graphic-savvy, check out “14 Design Tools We Love for Blogging.” My personal favorite: Canva. 2) You don’t spend enough time editing. Not taking the time to edit is the most obvious, but overlooked mistake a blogger can make. Grammar mistakes and typos often contribute to the lack of fluidity within blog posts. Don’t let laziness ruin your content. Spell check and reread your post several times. If it helps, have someone else read it before you press that publish button. As a writer, poor grammar and editing hinders your credibility. 3) Your posts are too hard to read visually. Sometimes you can write the most amazing content, but your poor design choices turn readers off. 4) Your images need help. Try to always use high-resolution images. Not only are they easy on the eye, but they provide a sense of professionalism. The more credible your blog looks, the more readers will trust reading your blog. On top of image quality, make sure you are properly resizing your images. Do not distort them. Need multimedia for your blog post? Learn how to use PR Newswire for Journalists’ multimedia gallery to find and download thousands of photos and video. 5) You’re using auto-start music players. Nothing is worse than stumbling upon a website, only to hear annoying music once the page loads. What was once popular during the Myspace age has gone extinct. In addition, music players can make your page lag, dissuading readers from continuing onto your site. Get rid of that auto-start music player, and if necessary embed links from sites like SoundCloud or YouTube that allow readers to play the media at their leisure. 6) Your blog is too egocentric. Yes, your blog should show your personality and share your experiences – but only if it will benefit the reader. Your blog is not a reality TV show. The harsh reality is that unless you’re either a high-profile celebrity, unbelievably entertaining, or someone willing to publicize their whole life with no inhibition, no one is going to care about your personal life but your close friends. Use your experiences only to enhance your message. The majority of your readers do not want to know anything about you unless it benefits them in some sort of way. Remember your blog should be more about your reader! Try acknowledging other bloggers as well. Take the time to cater to your readers here and there by hosting giveaways, conducting surveys and interviews, thanking them, commenting back, etc. 7) There’s too much quantity, not enough quality. Don’t oversaturate your readers with pointless blogs posts, especially for SEO purposes. Sure you’re on a schedule, but the worst thing you can do to a reader is waste their time reading mush. Plain and simple. 8) You’re not paying attention to your readership. Know who you’re writing for and understand your audience may even change. Always pay attention to who is reading your blog, who’s commenting, etc. For example, you started your blog with a general audience in mind, but may realize more readers are being attracted to specific topics. You can then perhaps focus on those topics more. 9) Your headlines are boring. Headlines are the first thing readers see across social media platforms. Make it count! Headlines equal first impressions of your content. Draw your readers in by catching their interest. Use creative titles, but at the same time make it clear what you’re offering. Struggle with headline writing? Here are 9 things not to do. 10) Don’t expect people to visit. So your first few blog posts were a hit – great! Now what? A common mistake new bloggers make is expecting their readers to be regular visitors. The second half of blogging entails promoting your blog. Readers all over the internet and social media are lazy. They hate putting in the effort to visit websites – it has to stumble upon them instead. Publish your blog across different social media platforms – Twitter, Facebook, Pinterest, etc. Without findability, most people won’t know you’ve written a new post. Spread the word about your blog wherever you can, but at the same time try not to over promote it in an annoying way. It’s also great to promote your blog within your targeted networks via groups on social media, forums, blogging events, etc. Learn more about strategies and tools for promoting your blog in part 2 of our #BlogTips webinar series. Register at http://bit.ly/1xO8JJw and live tweet with us that day using #blogtips. Editing is my number one problem! I recently posted an article and spelled Twitter wrong in the title! Took me 3 days to realize why it wasn’t getting many hits. Excellent tips! Haha, that’s funny! Typos are my vice, and thanks! Thank you. Some very helpful advice here.